westerns like Johnny Thunder and The Wyoming Kid, war comics like Sgt. Rock and The Haunted Tank, teenage humor like Scribbly and Buzzy, and funny animals like The Dodo & the Frog. 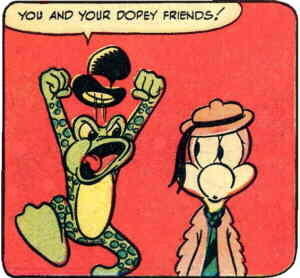 Dunbar Dodo and Fennimore Frog made their first appearance in the 18th issue (February, 1947) of DC's Funny Stuff, where the stars included J. Rufus Lion and The Three Mouseketeers. They replaced two features, McSnurtle the Turtle (probably the best remembered of Funny Stuff's early features) and Bulldog Drumhead (a parody of a fictional detective). They were clearly intended from the start to be the title's stars, as they not only had two stories, but also snagged the cover — and never gave it up as long as Funny Stuff lasted. Their schtick was that Dunbar was a dodo, not just by species but also by mental capacity. Fennimore was constantly taking advantage of him, but usually wound up outsmarting himself. The artist on that first outing, as well as most subsequent ones, was Otto Feuer, formerly an animator at Famous Studios. Feuer's other work for DC's funny animal line included Peter Porkchops, Raccoon Kids and dozens of less prominent series. The writer was Woody Gelman, later the Topps executive who gave the go-ahead to Mars Attacks. About a year after their debut, Dunbar and Fennimore moved into a second venue. DC converted Comic Cavalcade, where The Flash, Green Lantern and Wonder Woman had been sharing the covers, into a funny animal anthology. From January, 1948 until the title's demise in 1954, The Dodo & the Frog shared the Comic Cavalcade covers with Nutsy Squirrel and The Fox & the Crow. They got their own comic, in a way, in October, 1954, when Funny Stuff's title was changed to The Dodo & the Frog. But the glory was short-lived, as it started being published sporadically a couple of years later, and ended altogether with #92 (November, 1957). Since then, they've turned up on rare occasions, usually as reprints. Their most prominent post-series appearance was in Captain Carrot & His Amazing Zoo Crew #3 (May, 1982), where, ignoring his previous characterization as an imbecile, the Dodo appeared as captain of a luxury cruise ship; and, ignoring his previous characterization as an inept chiseler, the Frog appeared as that issue's menace, Frogzilla. Like most of DC's funny animal properties, they're now pretty much forgotten.